ADT Home Security has been steadily securing it's spot in the Home Automation arena. A new partnership with Nest Laboratories adds a new dimension to the ever expanding smart home scene. In 2010 ADT Pulse offered the first home security / home automation platform for the mass market. This partnership with Nest offers what is hopefully the first of many after market items slated for integration to an existing Pulse system for use with new installs. Nest's Learning thermostat boasts a bright LCD screen, a 320x320px 1.75-inch display, a built-in rechargeable lithium ion battery and it speaks 4 languages. They have made the install super easy too. According to Nest, they invented the learning thermostat because most people are not going to program their thermostat, it's just too complicated. That could make the extra money spent on most programmable thermostats a bigger waste with no results and a pricier unit. So they made it simple by creating a thermostat that programs itself. With modern features like a green leaf that displays until you are on a setting considered outside of economical heating or cooling parameters and a report to tell you when you are using the most energy, you'll feel well informed and more in control of your heating and cooling costs. It also know how good it feels when someone lights up just because you walked into the room, so it does! You'll feel the love whenyour Nest back lights the display so you can see the temperature or time from way across the room. Nest Labs took the big square bulky design and replaced it with a sleek, hockey-puck sized unit that you rotate to your desired setting and push in to select. 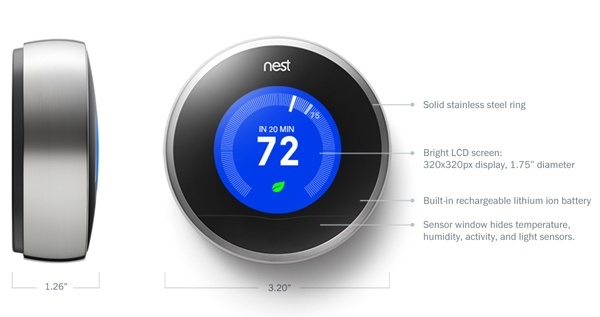 Nest Thermostats can be controled manually or by a mobile app. When you have a Nest thermostat and ADT Pulse home automation, your Nest Learning Thermostat can also be controlled in the ADT Pulse mobile app. What Else is ADT Up To? The Nest Thermostats are able to be used with the ADT Pulse App version 7.3.0. The new look of the latest update has been Improved and pinch/pan zoom support was added for images in the gallery. Also on the horizon is a channel on IFTTT. If you are not familiar with IFTTT, which stands for if this then that, it is an app that allows a function or action on one app to cause an event in another. For example, when your FitBit realizes that you are awake, an ADT Pulse appliance module can be powered to activate a coffee pot. With over 140 channels from the weather channel to GE cooking appliances, it is redefining how home automation works. This is the beginning of even more exciting things to come. For now, download the ADT Pulse App for Android devices here and for Apple Devices here. To get a price quote for your own pulse system click below. Publisher's Note: Origianlly published on 7/28/2015 with the 7.0.0 updage of the ADT Pulse App. Updated on 11/2/2015 to include the ADT Pulse app update 7.2.0.